Hello~my name is Yuki Yamashita. I am 21 years-old and was studying at UW for a year in 2011. I would love to introduce new aspects of japanese culture to you guys!!! 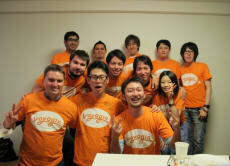 Party with the Voyagin Team! I attended "Come Party with the Voyagin Team!" just a few hours after I arrived in Tokyo for the very first time. I was overwhelmed with impressions and the best think that could have happened to me was this event because I could meet people from other countries to share my impressions with but at the same time meet people who have lived in Tokyo all their lives. We had a great time this night! The Voyagin Team is highly motivated to help you get the best out of your stay here. From my experience, I am highly recommending Voyagin and I am sure to be attending another event soon!